This country's independence is worth a show-stopping dessert, and we think this pie is it. Bursting with summer flavors — strawberry and rhubarb — and decorated to honor the Stars and Stripes, this pie will guarantee that you'll have no trouble competing with fireworks this year! 30 mins. to 60 mins. 1 hrs 15 mins. to 1 hrs 30 mins. To make the crust: Divide the pastry into two pieces — one about 2/3 of the total, the other 1/3. Roll the larger piece of pastry into a round, and place it in a 9" pie pan. Refrigerate for at least 30 minutes. To make the strawberry-rhubarb filling: Whisk together the sugar, enhancer, and salt, and toss with the rhubarb and strawberries. Set aside. To make the blueberry filling: Whisk together the sugar and enhancer. Toss the blueberries with the sugar mixture, then stir in the lemon juice. Fill a 90° wedge of the pie shell with blueberry filling and the remaining 270° wedge with strawberry-rhubarb filling. See "tips," below, for suggestions how to do this. Roll the remaining crust into a 10" x 6" rectangle about 3/8" thick. 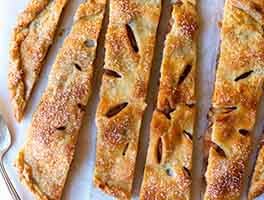 Cut the dough, lengthwise, into five to six 3/4"-wide, 10"-long strips. Cut three to five 1 1/4" stars from the remaining dough. Place the strips parallel to one another over the strawberry-rhubarb section, cutting any excess off the ends and pinching them to the edge of the crust. Place the stars atop the blueberry filling. 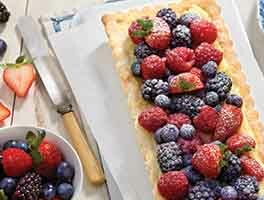 Brush stars, stripes, and outer crust with water, and sprinkle with sparkling sugar, if desired. Place the pie on a baking sheet (to catch the drips), and bake for 30 minutes. Reduce the oven heat to 375°F and bake for an additional 45 to 60 minutes, until the filling is bubbling and the crust nicely browned. Remove the pie from the oven, and let it cool for at least an hour before serving. The pie may be served warm, but it'll be a bit messy; it sets as it cools. 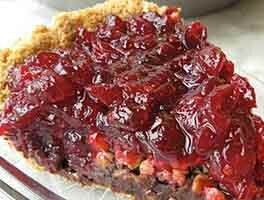 If rhubarb isn't in season or available in your area, use all strawberries for the red portion of your pie. Combine 5 to 6 cups hulled and quartered strawberries with 1/2 cup Pie Filling Enhancer and 2 teaspoons lemon juice. Finish and bake the pie according to the recipe instructions. 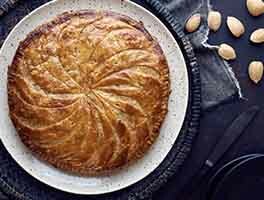 "When you're dividing your pastry for a double-crust pie, the bottom crust should be a significantly larger chunk than the top crust — about 2/3 for the bottom, 1/3 for the top." 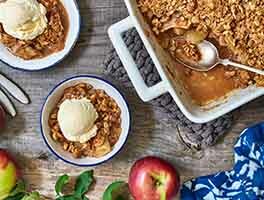 A simple tip from our blog, Flourish, that will help you when making this pie. To help create even wedges for both fillings, starting from the center of the unfilled crust, use a piece of aluminum foil to block off a 90° wedge. Remove the foil once you've filled both wedges and before you bake the pie. If you have an adjustable pie dam, it's very handy for this task. Made this for the 4th of July and it was truly amazing. This was the first time making a pie crust from scratch although I bake all the time. It wasn't hard at all however my pie crust shrunk down and my pie edging that I worked so hard on had disappeared into the pie. Any ideas on what caused this? The blueberries and local strawberries were sweet mixed with the pie crust and gave that perfect bite served warmed with vanilla ice cream from our local farm stand. This was a winner! Another super recipe from KAF. What a hit! So appropriate and absolutely delicious (although there were some complaints that one had to choose between blueberry and strawberry/rhubarb). I used the little star cutout for linzer cookies, which worked perfectly. Also posted a photo on FaceBook and got many requests for the recipe, and directed them to KAF. This year, I will make two for the 4th. I cheated with the Pillsbury roll up pie dough because I was out of time. Worked perfectly. have made four or five times in the past few years (4th of July, Memorial Day) and every time people want to photograph it. the presentation is great. it is easy to prepare. cardboard works just fine for separating the blueberry from the strawberry rhubarb section; don't need a fancy gadget. the strawberry rhubarb is delicious. the blueberry is very good, too. 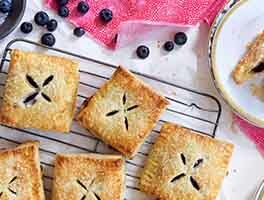 a two crust pie recipe leaves plenty of extra pie crust dough for something else, either a small pie or pie crust cookies. too bad rhubarb isn't around for thanksgiving. Turned out beautifully. I was confused by whether or not to add salt to the fruit since the notes for this recipe said to add if using only strawberries but the blog didn't include the salt. Used the pie filling enhancer substitute recipe and ended up with a lot of it for the blueberries so spread some over the strawberries too. Though I did make the cut out stars I found that it looked nicer with the cut out portion (the negative of the stars) put on the pie. So I sprinkled the stars over the over pie afterwards and thought it was super cute! Made this pie last year, it was a hit! It looked beautiful and tasted great, a fun twist on my favorite strawberry-rhubarb. The filling was just the right balance of sweet and tart, and thickened up properly. Amazing presentation! Took a little bit of extra effort, but well worth it. A new summer staple! Delicious and beautiful! Everyone at the party was so impressed! This pie was perfect! The crust was tasty and flaky. I thought I ordered the pie enhancer when I received my order the day I made this pie, but I guess I forgot to put it in my cart before I checked out. I was freaking out because I was baking the pie the morning of the 4th! I read some tips on the blog and decided instead of using cornstarch as a thickener I would use arrowroot powder (which I also had in my pantry). I had a hard time making the stars because I didn't have star-shaped cookie cutters. I put on my charm and asked my dear husband to try cutting out the stars for me. It turns out he has a hidden talent for it. Of course, later when everyone was raving about my pie he told them that he made it. The pie was absolutely delicious and adorable and a huge hit at my family's July 4th gathering. I would definitely make it again! Beautiful and delicious! It was definitely fun to make but as far as easy. . . I made my own crust because it is so much better than store bought but it was a bit challenging cutting out the stars and stripes. But well worth the effort! !